The Union Cabinet, chaired by the Prime Minister Shri Narendra Modi has given its approval for National Capital Goods Policy. This is first ever policy for Capital Goods sector with a clear objective of increasing production of capital goods from Rs.2,30,000 crore in 2014-15 to Rs.7,50,000 crore in 2025 and raising direct and indirect employment from the current 8.4 million to 30 million. The policy envisages increasing exports from the current 27 percent to 40 percent of production. It will increase the share of domestic production in India’s demand from 60 percent to 80 percent thus making India a net exporter of capital goods. The policy also aims to facilitate improvement in technology depth across sub-sectors, increase skill availability, ensure mandatory standards and promote growth and capacity building of MSMEs. The Policy will help in realising the vision of ‘Building India as the World class hub for Capital Goods’. It will also play a pivotal role in overall manufacturing as the pillar of strength to the vision of ‘Make in India’. 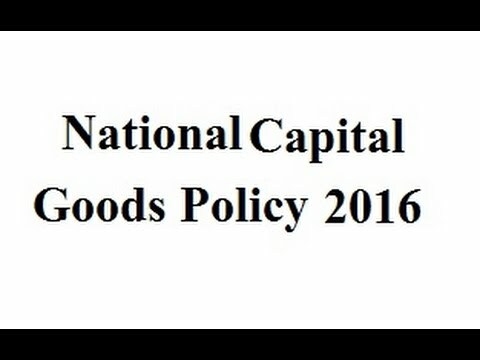 The idea of a ‘National Capital Goods Policy’ was first presented by the Deptt. of Heavy Industry to the Prime Minister in the ‘Make in India’ workshop held in December, 2014. The policy has been finalized after extensive stakeholder consultations with industry, academia, different ministries etc. The key recommendations and elements of the policy have been formulated to support and boost development of this crucial sector. The aim of the policy is create game changing strategies for the capital goods sector. Some of the key issues addressed include availability of finance, raw material, innovation and technology, productivity, quality and environment friendly manufacturing practices, promoting exports and creating domestic demand.